Peter Katin is an astonishing pianist. When I listen to his playing of both Schubert and Chopin, composers whose music I am not espoused to and solely for musical reasons, I have to marvel that his convincing performances are such that I do listen to these composers and with interest. Chopin is the better composer of the two I have mentioned because his music is not overblown but, generally, states its ideas simply and comparatively tersely ... whereas Schubert can meander and repeat himself at great length. Katin is undoubtedly the Chopin specialist ... not only in fact but in performances. There are some gems in this recording particularly the haunting slow movement of the Piano Sonata No 1, Op 4. To me, this is Chopin at his best, devoid of those pretty cascades and frilly scales and a 3/4 tempo. It is a piece of genuine beauty and while I do not wish to take issue with Peter, or with Chopin, who both believe that the Sonata, as a whole, should never have seen the light of day, I do wish Katin would record it so that we could assess it played by an expert. How exquisitely he unfolds the Berceuse, Op 57, another work of exceptional beauty. It is tender without being sentimental and, believe me, it takes the greatest of pianists to be able to achieve that. Having seen his performances of the Bolero, Op 19 many times, I knew what to expect in another dependable and reliable reading. The Rondo in C minor, Op 1 brought Chopin great success and should be better known. But what is most staggering is the Polonaise in G minor written when Chopin was only seven years of age! While it is trammelled by 'over-correctness' it is a commendable piece as is the Polonaise in B flat written when he was only eight! The Variations Brilliantes, Op 12 are played with great panache although it is not the type of Chopin I prefer. The Souvenir de Paganini does nothing for me either but its charm will certainly appeal to the majority. 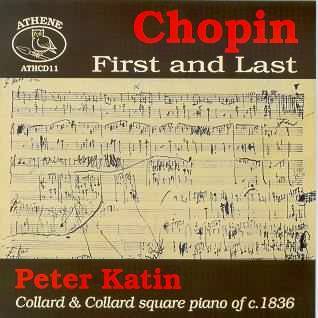 The Three Waltzes, Op 64 are regularly included in Peter Katin's Chopin recitals and I do admire his performances. He is not a cheap sensational pianist out for show and self-aggrandisement but a perfectionist always concerned with true accounts of the composer's written score. There are some Mazurkas and Nocturnes including a very telling Nocturne in C# minor, one of those Chopin works that bares his soul to the discerning listener and helps us, or at least interests us to know more of this complex and fascinating composer. As one would expect the performances are exemplary. Chopin should always be played like this. It shines a light and also gives a clear message even in the hearts of those unconvinced about his music.